Interface products to increase test efficiency and productivity will be launched at IEEE AutoTestCon 2018 (17 to 20 September). The modular signal switching and simulation specialist will premiere the PXI RTD simulator, resistor modules and a six-slot USB/LXI chassis. The high-accuracy PXI RTD simulator, the 40-263, is a cost-effective method of simulating PT100, PT500 or PT1000 RTDs from -150 to +850 degree C. The unit supports four, eight 12, 16, 20 or 24 channels in one or two PXI slots. Channels may be set as short- or open-circuit to simulate faulty wiring to a sensor. The module is available with 40 to 900 Ohm resistance for PT100 simulation, 200 to 4500 Ohm for PT500 simulation and 400 to 9000 Ohm for PT1000 simulation. Control is simple, using resistance calls, adds Pickering. The 60-106 six-slot modular LXI/USB chassis offers a small lightweight form factor, making it suitable for portable, bench-top, and space-restricted applications. 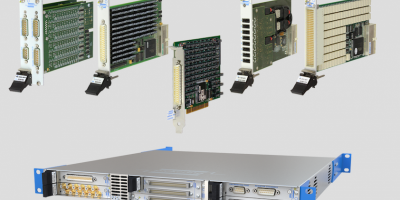 The chassis supports between one and six 3U PXI modules and accepts Pickering’s PXI products. Possible systems include switching matrices up to 3312 crosspoints (three 40-560 BRIC2 occupying three pairs of slots) or up to 108 channels of programmable resistor/sensor emulation (six 40-295 18-channel resistor modules occupying six slots). The USB 2.0 Hub (model 42-738) is a single-slot 3U PXIe module that combines an eight-port USB 2.0 hub and USB data/power switching to provide a controlled connection between the backplane and USB products. Each port can connect and disconnect the power and data paths separately, simulating various connection faults. The module can be used to connect a USB device under test or USB test equipment to the test system without reliance on the controller’s USB ports, eliminating the need for freestanding powered hubs in a test system. It also provides a simple way of expanding the range of test equipment supported by PXI-based test systems to include USB power meters, USB data acquisition systems and USB scopes. The high-density modular LXI Ethernet scalable reed relay matrix (65-2xx) can be configured by the insertion of up to six LXI plug-in modules. Cooling, which is adaptive to minimise acoustic noise, is provided by fans at the rear of the unit, ensuring no space is wasted when the chassis is rack mounted. In partnership with VX Instruments, Pickering will be demonstrating VX Instruments’ PXM7820 high-speed multi-measurement device operating in an LXI Ethernet environment through a two-slot USB/LXI modular chassis (model 60-104). The PXM7820 features a 16-bit DMM, 16-bit digitiser, counter/timer, and a high voltage input circuitry. The PXM7820 allows all of Pickering’s LXI/USB modular chassis to perform measurements as well as controlling switching in a single chassis.